In 2005 and 2006, hydrogeochemical study was carried out in the bipartite Wiśniówka Mała pit lake of the Holy Cross Mountains (south-central Poland). This is the largest acidic water body in Poland. This report presents the element concentrations in the water and sediment, stable sulfur and oxygen isotope ratios in the soluble sulfates, and stable oxygen isotope ratio in the water. The scope of the investigation also encompassed mineralogical examinations (scanning electron microscope, X-ray diffraction) of the sediment. The results of this study show that there is a spatial and temporal variability in concentrations of most elements and sulfur isotope ratios in the examined pit lake. The water of the western pond displayed a lower pH with a mean of 3.73 and higher conductivity (390 μS cm−1) as well as higher concentrations of sulfates (156 mg L−1) and most of the cations and anions. The concentrations of Fe2+ and Fe3+ averaged 0.8 and 0.4 mg·L−1. In contrast, the eastern pond water revealed a higher pH (mean of 4.36), lower conductivity (293 μS cm−1) and lower sulfate (90 mg L−1) and trace metal levels. Similar variations were recorded in the stable sulfur isotope ratios. The δ34SV-CDT(SO4 2−) values in the water of the western pit pond were in the range of −6.7 to −4.6‰ (mean of −5.6‰), whereas that in the eastern pit pond ranged from −2.2 to −0.9‰ (−1.6‰). The alkalinity of the entire lake water was below 0.1 mg·L−1 CaCO3. No distinct difference in the δ18OV-SMOW(SO4 2−) was noted between the western and eastern pit ponds. Compared to the Purple Pond in the Sudetes (Poland) and similar sites throughout the world, the examined pit lake is highlighted by distinctly low concentrations of sulfates, iron and other trace metals. Based on this and other studies performed in the Holy Cross Mountains, a conclusion can be drawn that the SO4 2− in the Wiśniówka Mała pit lake water is a mixture of SO4 2− derived from the following sources: (1) pyrite oxidation (especially in the western pond water), (2) leaching of soluble sulfates from soils and waste material, as well as (3) subordinate deposition of airborne sulfate precipitation. We are grateful to a number of colleagues of the Central Chemical Laboratory of the Polish Geological Institute in Warsaw for their assistance in performing most of the chemical analyses. 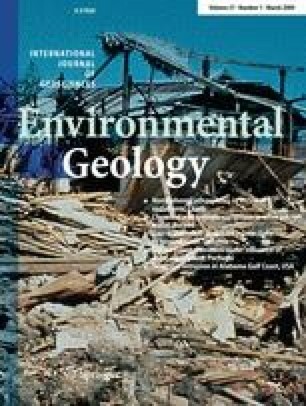 The authors also thank Dr. Paul J. Lamothe of the US Geological Survey in Denver for the insightful review that considerably improved the quality of the manuscript. This study was supported by a research grant by the Ministry of Science and Higher Education (No. 2 P04G 041 30).